It turns out many of us have even the most basic of panther facts wrong. We tend to assume that a panther is an entirely separate species of big cat. However, when we discuss panther facts, we usually actually mean either jaguar or leopard facts, depending on the geographic location. 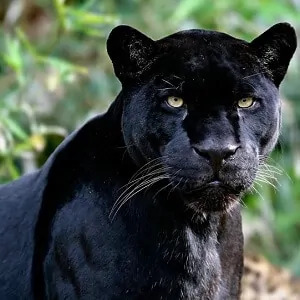 This is because a panther is defined as a melanistic color variant of other species in the Panthera genus, which includes tigers, lions, jaguars and leopards. This color variant usually means that the cat is black or dark brown, since melanism is the development of melanin, a dark-colored pigment in the skin. A panther is therefore usually either a black leopard in Asia and Africa, known as Panthera pardus, or a black jaguar in the Americas, known as Panthera onca. Melanism can be a useful evolutionary process. Panther facts show that the darker individuals in a species are often better camouflaged, and therefore more likely to survive and reproduce. This is particularly true in certain natural conditions, for example in regions of dense forest with little light, where instances of melanism are more common. In the Panthera onca, the type of panther that comes from the jaguar species, melanism is therefore conferred through a dominant gene. This means that black jaguars can have either black or spotted cubs, but normal jaguars only produce regular spotted cubs. Since panthers come from different species of big cat, there is a wide variety of panther facts relating to the environments which they can inhabit. Black leopards are common in Africa and Asia. They are found in locations with dense vegetation, such as the slopes of African mountain ranges (Mount Kenya for example) and tropical forests in areas of China, Nepal, Sri Lanka, Malaysia and Indonesia. Black jaguars, on the other hand, prefer wet lowlands and savannahs, as well as rainforests. 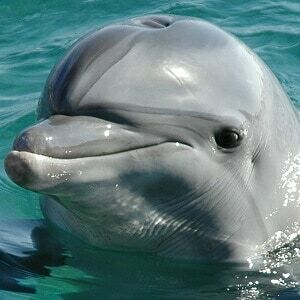 They are found mainly in Central and South America, for example in the Amazon rainforest. 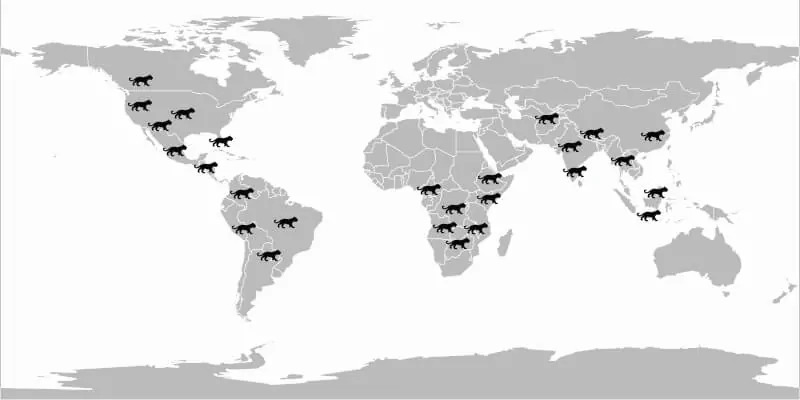 Panthers were once present in North America, but have not officially resided on the continent for a long time. There are, however, frequent but unconfirmed sightings of panthers in North America. Panthers are carnivorous, and generally prey upon small to medium-sized herbivores, although exactly which species depends on the environment they are in. Animals which can form a part of their diet include antelope, deer, warthog, tapir, wild boar, rabbits and birds. There are many panther facts relating to this animal’s formidable hunting prowess. One of the biggest factors that distinguishes panthers from other big cats is their stealth. 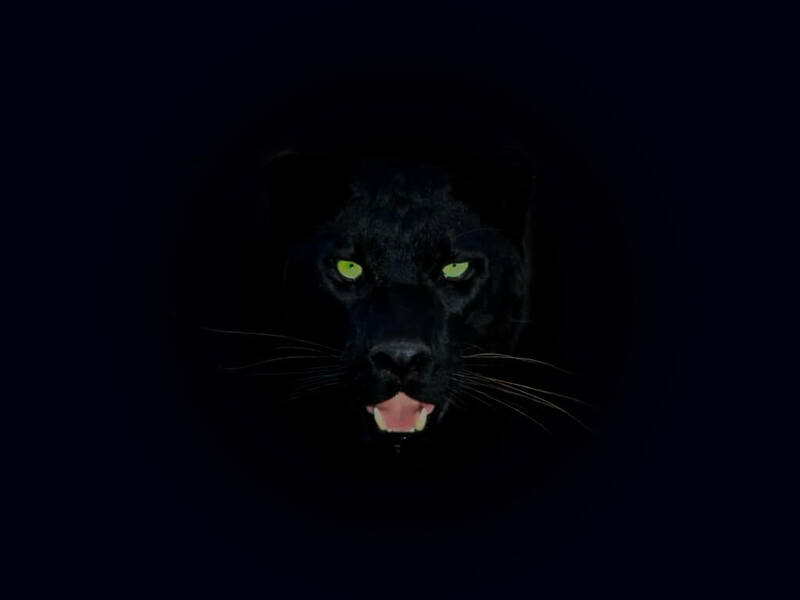 Panthers are nocturnal, so hunt at night. Their dark fur allows them to seamlessly camouflage with their surroundings, while their excellent eyesight and sense of smell help them to locate prey. Panthers generally hunt on the ground, but have been known to ambush prey from trees. As well as their camouflage ability, there are many other panther facts which add up to make this big cat one fearsome predator. Panthers can run at speeds of up to 35 mph, helping them to catch up with fast prey such as deer and antelope. They are also incredibly agile, and are able to leap up to 20 ft. in pursuit of their prey. Another one of the more unique panther facts relates to their climbing ability. Of all the big cats, panthers are some of the very best at climbing. They often use trees to their advantage, whether for hiding in for safety or for watching and ambushing prey. In addition, their strong jaws enable them to drag heavy prey into the branches of trees in order to feed safely. There are some intriguing panther facts relating to their behavior. The panther is a very solitary animal, and usually lives, hunts and travels alone. The one exception to this rule is during the mating season. When she is ready to mate, the female panther will leave scent markings for the male to follow, and also makes a sawing sound to let him know where she is. After they have mated, the pair will rarely stay together for more than a few days. The age of sexual maturity for the female panther is usually around 2 years, and she will have her first litter at around 2 1/2 years old. The male panther is also capable of mating at the age of 2 but, because of fierce competition from older males, does not usually have the opportunity until he is 3 or 4 years old. It is common for fights to break out among male panthers during mating season. The gestation period for a female panther is around 3 months, and results in a litter of 2-4 cubs being born. Panthers usually give birth in a safe den. The male plays no part in the raising of panther cubs, which stay with their mother for almost 2 years. When they are very young, cubs are small and vulnerable, and are blind for the first 2 weeks of their lives. During this time, predator attacks upon the den can threaten their lives, particularly when the mother is out hunting. After a few months, however, the cubs are ready to accompany their mother. One of the more extraordinary panther facts regards just how quickly these young panthers learn. After just 2-3 months, the cubs learn to hunt, and by the age of 9 months they are able to bring down medium-sized prey. Panther cubs are not always born to panther parents, however. Since the panther color variant is caused by a dominant gene in jaguars, and a recessive gene in leopards, in either case it can occur in litters of normal jaguar or leopard cubs. This means that a leopard mother, for example, could give birth to a litter of both normal spotted leopards, and black leopards (panthers). One of the more somber panther facts is that these animals are extremely rare. This is partly because of genetics, but also because these magnificent creatures and their habitats are at risk, increasingly so in recent times. Human activity, such as industrial deforestation, is greatly reducing the amount of territory available for these big cats to live on. 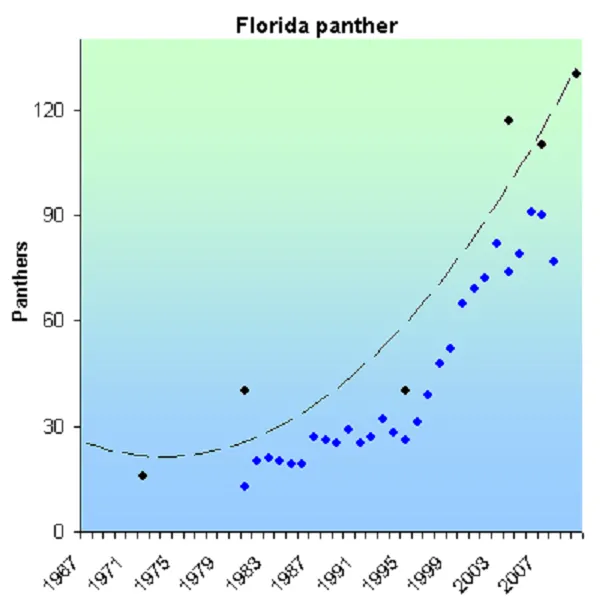 Furthermore, the hunting of panthers for their fur, or for other trophies, has caused a vast decline in their numbers, along with those of regular leopards and jaguars. Panthers are now so rare, and so stealthy, that they are rarely seen by humans at all. For this reason, they are known as the ghosts of the forest. Panthers are now considered to be endangered, since, although they are not a distinct species, both leopards and jaguars are considered to be threatened. There are many interesting historical panther facts. It is believed that the genus panthera originally evolved in Asia, although its exact roots remain unclear. Members of this genus probably diverged from their subfamily Felinae around 6-10 million years ago. During the last two centuries, we have learned more and more biological panther facts which have helped to classify these creatures. In 1816 the German naturalist Lorenz Oken, considering the Felidae family as a whole, distinguished the panthera genus as separate. In 1816 the British taxonomist Reginald Pocock extended and refined these classifications, concluding that the genus contained jaguars, leopards, tigers and lions. He came to this conclusion after studying skulls and skins in London’s Natural History Museum. Since panthers are defined by the melanin in their skin, when we think of panther facts we tend to imagine a large black or dark brown cat. This is accurate, unless you look very closely! On closer examination, panthers have the same markings as their leopard and jaguar peers, with the pattern visible through the darkness of the coat. This effect is known as “ghost striping”, and has a similar appearance to printed silk. While there are many interesting panther facts, these animals also inspire a large amount of speculation. In North America, for example, there have been many sightings of black cats through the ages, which believers claim are melanistic cougars. 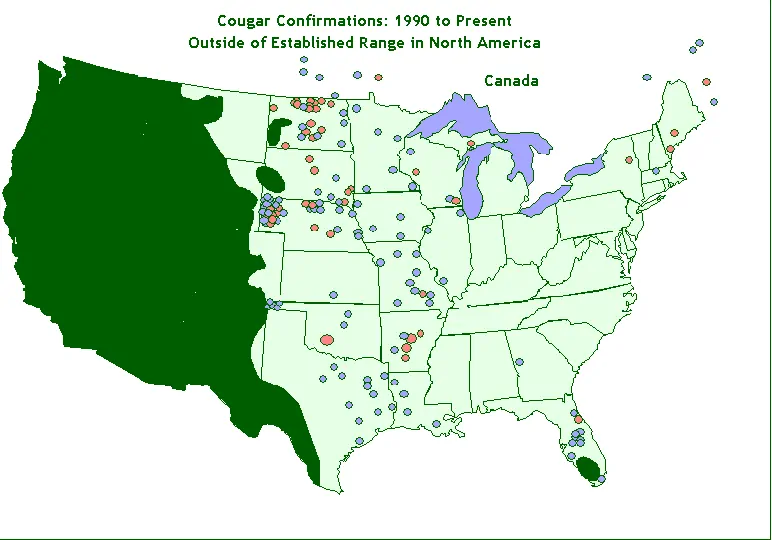 However, no black cougar or mountain lion has ever been photographed, shot or bred in North America, and experts generally agree that it does not exist. 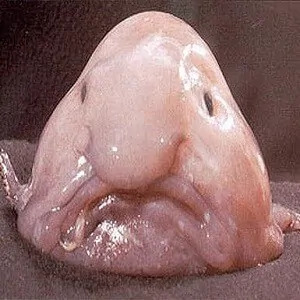 Any such reports are attributed to mistaken identity, or mistakes about the size of the creature. This makes the North American black panther a cryptid, that is, an animal whose existence is not proven, or an animal known to exist but alleged to be in an unexpected place. These unconfirmed – but regular – reports of black cat sightings in strange places are not just confined to North America. In Great Britain, there are over a 1,000 reports of large black cat sightings each year. While experts remain skeptical about the existence of a panther population in Britain, there is an argument that many exotic animals may survive in the British countryside as a result of the Dangerous Wild Animals Act of 1976. This Act placed heavy restrictions on the ownership of exotic pets and could have meant many large cats were released into the wild at once. In Australia, too, there are many rumors of big cat populations. The Blue Mountains Panther, for example, is one of these phantom cats. Many argue that this panther is descended from escapees of a zoo or circus. There is another theory that black panthers were used as military mascots for American soldiers in World War II, who were stationed in Australia. Believers argue that the mascot panthers escaped and began to live in the Australian wild. One of the more surprising panther facts tells us just how much these creatures like water, unlike most domestic pet cats! The panthera pardus, descended from leopards, is not a fan of the water. But it is a very different story for the panthera onca. These black jaguars love to swim, and their preferred habitat includes flooded forests and swampy wetlands. 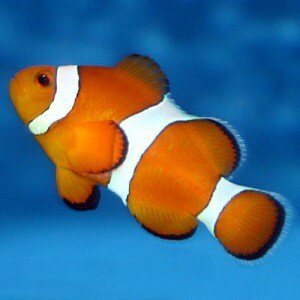 But more than this, they also swim recreationally, and can spend a significant portion of their time cooling off, swimming, playing and relaxing in water. Forget Joseph’s Technicolor Dream Coat, it was the panther who had the most impressive hide in ancient times! When searching for panther facts in the realms of mythology, we can find many interesting interpretations of this fearsome beast and its behavior. In various European mythologies the panther was a multi-colored beast that feasted on the flesh of many creatures, then retreated to a cave to sleep for 3 days. When the beast awoke it would let out a roar, and a sweet smelling odor would fill the air, drawing all nearby creatures to the panther’s lair so that it could feast once again. Only the dragon was immune to the panther’s sweet-smelling but deadly breath. Since panthers are rare and magnificent, any panther in captivity is a popular sight. But there are panther facts relating to one special former inhabitant of Glasgow Zoo that are quite extraordinary. In the 1980s, the zoo acquired a black leopard that was 10 years of age. This panther had a condition known as vitiligo, which caused her black fur to be covered with thin white hairs. This made the panther look as if she had become tangled in fine cobwebs. ‘Cobweb Panther’, as she was consequently nicknamed, became famous. She was a popular exhibit in Britain before being moved to Madrid. There are many panther facts relating to the use of the name, and the idea of this creature, in the world of sport. The panther is one of the most popular and enduring symbols in United States sports, with teams in various sporting disciplines incorporating the panther into their name, and as a mascot. Such teams include the Pittsburg Panthers athletic teams, Carolina Panthers in football, Florida Panthers in ice hockey, and the Milwaukee Panthers in Basketball. The use of the panther as a symbol is hardly surprising. These animals have many qualities which are important in sport, including strength, agility, endurance, ingenuity and competitiveness. When it comes to panther facts, there can be confusion about what exactly counts as a panther, and this is often a linguistic issue. The Florida panther, for example, is actually a kind of cougar which lives in the swamps and forests of Florida. The species is known by many names, including mountain lion, cougar, and puma. 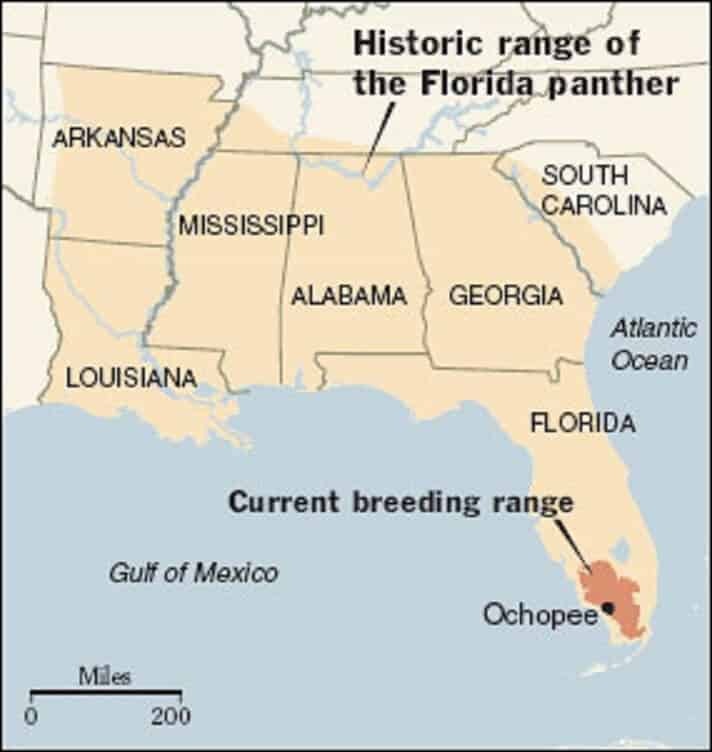 In southern Florida, however, locals exclusively call it a panther. This is not very surprising, since the word “panther” has a complicated history. There are many variations, from the Old French pantere to the Latin panthera. The Latin word pardus means leopard, but throughout history the words panthera and pardus were used often interchangeably. Since the panther itself is not a distinct species, and the word “panther” is used in various circumstances, it is not surprising that most people have some of their panther facts mixed up! One of the more heartwarming (and also bizarre) panther facts relates to how Jazhara the panther and her brother Tsunami came into being. At Canada’s Bear Creek Wildlife Sanctuary, a lioness named Lola and a black jaguar named Diablo were acquired within weeks of each other, and were raised in close quarters. Attempts to separate the two as they got older resulted in both animals exhibiting signs of distress − Lola even refused to eat! The couple were housed together again, and the result was something that many who knew their panther facts didn’t believe was possible. Two jaglion cubs were born in 2006; a male, Tsunami, who is tan-colored and spotted, and a female, Jazhara, who is a charcoal colored panther. There are many intriguing panther facts about these magnificent and secretive creatures. A panther is a melanistic color variant of other species of big cat, usually a leopard or a jaguar. They are black or dark brown in color, and inhabit forests, wetlands and grasslands. Panthers are very rare, and are also stealthy and solitary creatures, meaning that humans do not generally come into direct contact with them. They are expert hunters, using their impressive climbing, jumping and running skills to hunt down medium- to large-sized herbivores. The panther inspires a great deal of speculation in us, perhaps because of its secretive and mysterious nature. Frequent panther sightings are reported all around the world, even where no panthers are proven to live.